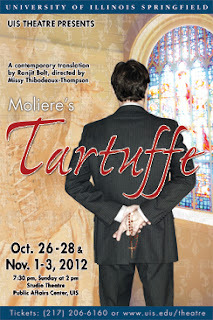 The Theatre Program at the University of Illinois Springfield will debut its first production of the 2012-13 season with the play Tartuffe by Molière, opening Friday, October 26. Six performances will be presented in the Studio Theatre, on the lower level of the Public Affairs Center at UIS - on Friday, Saturday, Sunday, October 26, 27, and 28, and Thursday, Friday, Saturday, November 1, 2, and 3. All shows will begin at 7:30 p.m., except the Sunday performance (October 28), which will begin at 2 p.m. The cast includes UIS students Jennica Danner (Dorine), Keegan Otwell (Damis), Diane Sahagun (Mariane), Nathaniel Ed (Valere), Blake Detherage (Tartuffe), and Hallie Lang-Kells (Laurent), along with alumni Sarah Collins (Elmire), Deirdre Blankenberger (Cleante), and Tom Hutchison (Officer). Community cast members include Susan Jeffers (Mme Pernelle), Amy Cantrall (Flipote), Christopher Beckstrom (Orgon), and Mary Myers (Loyal). Production team members include Assistant Professor of Theatre Dathan Powell as Scene Designer/Lighting Designer/Technical Director and staff member Wes Abbott as Lighting Technician. Student production team members include: John Spurgeon, Liza Torrence, Alex Shaver, Emma Gillespie, Christopher Holmes, Colin Kautz, Kelly Zoelzer, Hallie Lang-Kells, Gretchen Addis, Will Newton, Zhang Zinzhu, and David Hecht. For more information about this year's UIS Theatre season, contact Missy Thibodeaux-Thompson at 217/206-8307 or email mthom1@uis.edu, or visit www.uis.edu/theatre/.